We are happy to announce we are having two Prague 1968 Photography Exhibitions in Prague opening August 21 and August 22. The shows have been sponsored and supported by a grant from the US Embassy in Prague and supported by the Institute for the Study of Totalitarian Regimes (USTR). The American Center/US Embassy show opens August 21st and will move in September to the Moravian Library in Brno, the second largest city in the Czech Republic. When the show is concluded, the photographs will become part of the permanent collection of the National Museum. 40 of our Prague 1968 books will be delivered to the National Library of the Czech Republic, to be distributed to libraries throughout the country. The USTR show opens August 22nd and will be displayed outdoors in the beautiful Jungmannovo Square in the center of Prague on large panels and will be up through August 31st. We would like to thank the Mayor of Praha 1, Mr. Olfrich Lomecky for this opportunity to share the photographs with the people of Prague. We are very pleased to have these shows and grateful for the support and skillful work of the American Embassy and USTR and their wonderful staff members. We also thank our great Czech friends, especially Ivan Prokop and Josef Pazderka, for their warm friendship, skillful work and invaluable support. Prague, Czech Republic — Paul Goldsmith’s “Prague 1968,” will open with an Artist Reception at the Gallery Krasny Ztraty. READ MORE. Exhibition at the Consulate General for the Czech Republic in Los Angeles. Reception on August 21. Exhibition at Gallery 291/The Image Flow in Mill Valley. Opening Reception June 7. Second hardback edition of book, "Prague 1968" published. CEDAR RAPIDS — Paul Goldsmith’s “Prague 1968,” currently on display at the National Czech & Slovak Museum & Library, is a contemplative tour-de-force of social documentary photography. Cedar Rapids Gazette. Exhibition at the Embassy of the Czech Republic in Washington DC. Reception for Artist on April 17, 2012. Listen to the Commonwealth Club lecture, Eyewitness Accounts: The Prague Spring and Russian Occupation of 1968, Feb. 2, 21010. 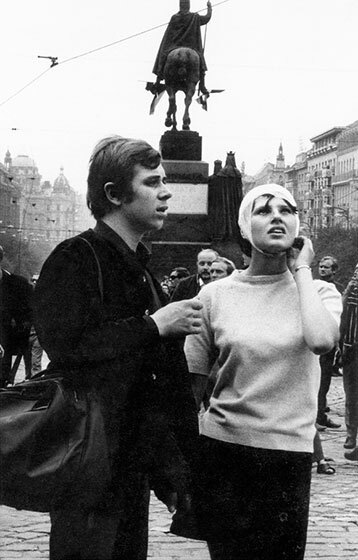 Joseph Pazderka, a Czech journalist has selected 20 photographs from Prague 1968 to be included in his forthcoming book entitled: INVAZE 1968 RUSKY POHLED. (The Russian View of the1968 Invasion). The book is being published by Torst Publishing in Prague, www.torst.cz and is scheduled for publication in August 2011. The Prague 1968 photography collection will be on exhibit at the Czech Center in New York City in March of 2012 - dates to be announced. The exhibit is jointly sponsored by the Czech Center, the Consulate General of the Czech Republic and the Bohemian Benevolent and Literary Society. Photograph of "Sit Down Wenceslas Square” was purchased and installed in a permanent exhibit at Mahatma Ghandi’s Phoenix house as part of the Woza Enanda Heritage Exhibit. The photographer, Paul Goldsmith, will give a brief account on how he happened to be in Prague during the course of 1968 when the small country challenged Soviet rule. His photographs will be on display in the Doe Library from November 15 through December 17. Professor John Connolly, Department of History, will provide the audience with an historical analysis of the situation in Czechoslovakia leading up to these events and the consequences of the Soviet invasion. On May 18, 2010, the Chicago Art Institute added eight of Paul’s Prague 1968 photographs to their permanent collection. The Art Institute has established one of the worlds’ most comprehensive collections of photography. The work will be in the company of legendary photojournalists such as Cartier-Bresson, Alfred Steiglitz, Walker Evans, Bruce Davidson and Danny Lyon. Slide Show scheduled to be shown at the Orinda Theater along with the presentation of “The Accidental Army” . Two showings 4 & 7 p.m.
Exhibit at the Commonwealth Club in San Francisco. Eyewitness Account Panel presentation with UC Berkeley Professor John Connelly, Petr Palecek, Alois Stand, Robert Koran and Hon. Richard Pivnicka as moderator at Commonwealth Club in San Francisco. Slide Show created and shown at Commonwealth Club. Five photographs acquired by the Museum of Modern Art of Houston for their permanent collection. Book published. Second of Edition of Prague 1968 includes new remarks from Condeleeza Rice in addition to commentary by George Schulz and Richard Pivnicka. Photo Exhibit at Café Prague. Group Show, Image Flow in Mill Valley.